We found that other nautical painting and here it is. 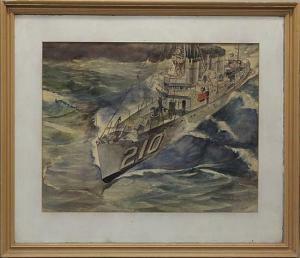 This nice watercolor entitled "Battleship" was sold in 2013 by Alderfer Auction and Appraisal. In our brief time exploring this master we have found oils, pastels and now watercolors. While this painting does not exhibit the technical draftsmanshiip of his oils, watercolor is by nature a more fluid medium. The work nicely conveys the action of the ocean and the speed of the boat.